BACKGROUND AND PURPOSE: Cyanoacrylates are effective occlusive agents in neurovascular interventions. To study their potential to improve long-term results of endovascular treatment of aneurysms, we conducted experimental studies in canine aneurysm models. METHODS: Venous pouch carotid aneurysms were constructed in dogs. Results of coil embolization of lateral wall and bifurcation aneurysms were compared. 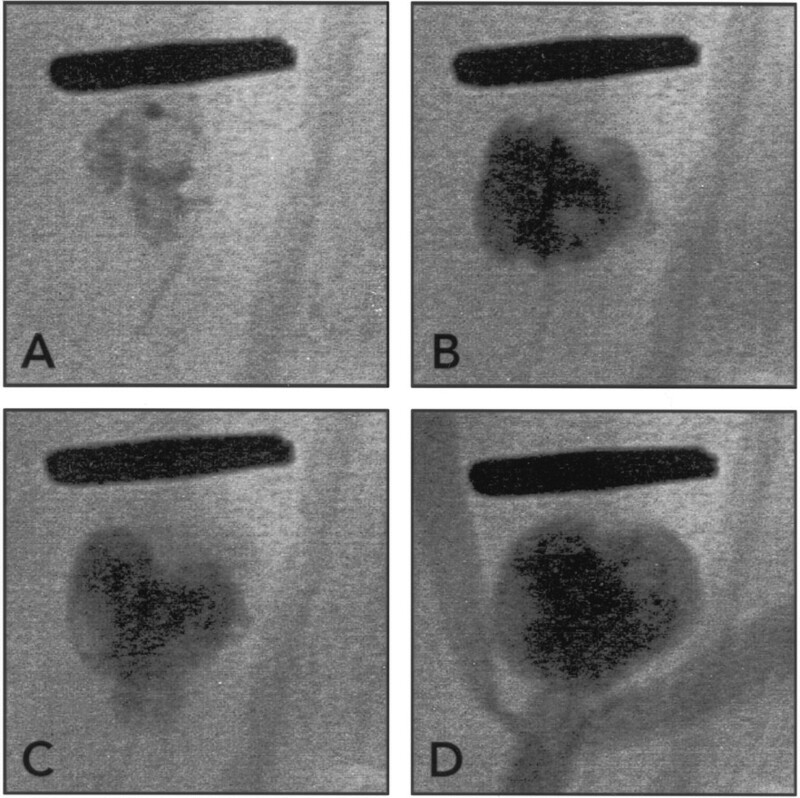 A lateral wall model of embolization with gelatin sponges was used to study the effects of coating sponges with cyanoacrylate on angiographic results and neointima thickness at 3 and 12 weeks. These models were also used to investigate the control of endovascular cyanoacrylate deposition, alone or over a coil placed at the neck of the treated lesions. The results of endovascular cyanoacrylate embolization of bifurcation aneurysms were compared with those of coil embolization at 3 months. RESULTS: Bifurcation aneurysms treated with coils showed more frequent recurrences (P < .01) and thinner neointimas (P < .01) at 3 months than did lateral wall aneurysms. Cyanoacrylate-coated sponges improved angiographic results (P < .05) and led to thicker neointimas at 3 and 12 weeks (P < .05) as compared with uncoated sponges. Endovascular cyanoacrylate deposition with microcatheters led to stray emboli in all cases. Cyanoacrylate delivery was improved by a single coil positioned at the neck of the aneurysm, but parent vessel embolization still occurred in 25% of the animals. Cyanoacrylate embolization of bifurcation aneurysms improved angiographic results at 3 months as compared with coil embolization (P < .01). CONCLUSION: Cyanoacrylate embolization is currently difficult to control. It has the potential to decrease recurrences after endovacular treatment of aneurysms, but a safe method for endovascular delivery has yet to be developed. Endovascular treatment of acutely ruptured aneurysms with Guglielmi detachable coils is both safe and effective (1–3). The main drawback of this approach is the incidence of recurrence, which is more frequent after embolization than after surgical clipping (4–7). We developed an aneurysm model prone to recurrence after embolization (8, 9). Recurrences in canine aneurysms embolized with gelatin sponges (Gelfoam; Upjohn, Kalamazoo, MI) are associated with deficient thrombosis and absent or incomplete neointima formation at the surface of the embolic agent (8). Morphologic results can be improved by the addition of fibrinogen and vascular smooth muscle cell autografts to sponges used for embolization (9). This approach may help to identify strategies to hasten healing of experimental aneurysms. However, it is not applicable in the setting of acute subarachnoid hemorrhage. Methods to improve the long-term results of embolization include surface modification of coils (4, 10, 11), addition of fibers (12), local growth factor delivery (13, 14), and embolization with polymers (15–18). Since the pioneering work of Zanetti and Sherman (19), Kerber et al (20), and Debrun et al (21), cyanoacrylates have never gained wide acceptance in the treatment of aneurysms, mainly because of the risks of cerebral infarction from uncontrolled escape of the polymers during deposition. To further study the potential for the use of cyanoacrylates in improving long-term results of endovascular treatment of aneurysms, we conducted experimental studies of their use in canine aneurysm models. To select appropriate animal models (22), we first compared coil embolization of lateral wall and bifurcation aneurysms, which may have a higher propensity for recurrences. Our next goal was to determine the effects of cyanoacrylate on neointima formation at the necks of aneurysms and the potential of cyanoacrylate to decrease recurrences in a lateral wall model of intraoperative embolization. We next assessed the feasibility of controlling endovascular polymer deposition by a retaining coil, stent, or an aneurysmal neck-bridge device (ANBD) (TriSpan; Target Therapeutics, Fremont, CA) placed at the necks of experimental aneurysms. Finally, we compared cyanoacrylate and coil embolization of bifurcation aneurysms. Protocols for animal experimentation were approved by the institutional Animal Committee in accordance with guidelines of the Canadian Council on Animal Care. Seventy-nine beagles weighing 10–15 kg were sedated with an intramuscular injection of acepromazine (0.1 mg/kg), glycopyrrolate (0.01 mg/kg), and butorphanol (0.1 mg/kg) and were anesthetized with intravenously administered thiopental (15 mg/kg). The animals were ventilated artificially and maintained under surgical anesthesia with 2% isoflurane. Postoperative analgesia was provided for 3 days by a 50-μg fentanyl skin patch. Lateral wall aneurysms were constructed on each common carotid artery by the technique presented by German and Black as modified by Graves et al (23). Two segments of the same external jugular vein were harvested for construction of the venous pouches. After temporary occlusion of the common carotid artery, an oval 5-mm arteriectomy was performed and the venous pouch was sutured to the arterial wall with 8-0 prolene. The fundus of lateral wall aneurysms measured approximately 10 mm, with a 5-mm neck. Terminal bifurcation aneurysms were constructed in a similar fashion after a T-type bifurcation was created between the two common carotid arteries according to the technique presented by Graves et al (24). Bifurcation aneurysms had a 12-mm fundus and a 5-mm neck. Transfemoral angiography was undertaken immediately after surgery in all animals. During recovery, the dogs were fed a normal diet and their activities were not restricted. Carotid angiography was repeated in anesthetized animals before euthanasia, by barbiturate overdose, to document the degree of aneurysmal obliteration. Healing at the necks of the aneurysms was assessed in vivo with angiography performed at 3 weeks and at 3 months. Multiple projections were studied by the same observer (J.R.), and the results were scored according to a previously described classification (2, 8, 9). A score of 0 indicated complete obliteration; 1, “dog ears”; 2, residual or recurrent neck; and 3, residual or recurrent aneurysm. A score of 4 was added for large saccular recurrences. The common carotid arteries were excised after the animals were killed. The wall of the artery was longitudinally opened to expose the luminal surface of the neck of the aneurysm. A 2-mm axial section of the aneurysm, taken from the middle of the neck, was sampled for neointima thickness measurement after formalin fixation and paraffin embedding. The neointimal layer at the neck of each aneurysm was measured at five locations on one midsection of the aneurysmal neck after staining with hematoxylin-phloxine-saffron (HPS), by using a computerized image analysis system (Clemex; Vision II, Longueuil, Quebec) as described previously (8, 9, 14). Immunohistochemistry served to characterize neointimal cells and cells inside the sponge at different time intervals after embolization, using antibodies to smooth muscle α-actin and von Willebrand factor (14). Mean neointima thicknesses (±SD) at 3 weeks and at 3 months were compared by means of analysis of variance and then Tukey tests for multiple comparisons. Mean initial angiographic scores (T0) were compared by using analysis of variance. Because of significant differences between various treatments, the initial score (T0) was subtracted from the score at time x to study the evolution of the angiographic scores (Tx–T0) by means of analysis of variance and then Tukey tests. A negative number means evolution toward occlusion, and a positive number means evolution toward recurrence. We wanted to determine the experimental model that would most likely reproduce the problems of residual necks and recurrences that we encounter in clinical practice. Thus, angiographic results and neointima thickness were studied 3 months after coil embolization of lateral wall (n = 6) and bifurcation (n = 6) aneurysms. Endovascular treatment was instituted by means of coaxial catheters introduced by a transfemoral approach. Coil embolization was performed at least 2 weeks after aneurysm construction, according to the technique routinely used in clinical practice: maximal packing at the fundus and neck of the aneurysm with coils of decreasing sizes after the first coils had formed a retaining “basket” bridging the neck. All coils and catheters were purchased from Target Therapeutics, Fremont, CA. Standard coils of 0.015-inch caliber were first introduced through Tracker 18 microcatheters, and “soft coils” were used for additional packing. The procedure was completed when coils could no longer be introduced inside the aneurysm. We previously reported a canine lateral wall aneurysm model that permitted us to reproduce the recurrences we wanted to address using intraoperative embolization with gelatin sponges (8, 9). Our plan was to use this model to circumvent the problems with endovascular cyanoacrylate delivery. The effects of cyanoacrylate on the angiographic results of embolization and on neointima formation at the necks of the treated lateral wall aneurysms were assessed at 3 weeks in 32 animals treated with uncoated (n = 16) and with cyanoacrylate-coated (n = 16) sponges. To detect the possible effects of iodized oil (Lipiodol; Therapex, Montreal, Quebec) used in the glue mixture, five dogs carrying an uncoated sponge on one side and a sponge coated with iodized oil on the other side were similarly studied at 3 weeks. Six animals with bilateral aneurysms treated on one side with uncoated sponges and on the contralateral side with cyanoacrylate-coated sponges were then followed up for 3 months. For intraoperative embolization, one 8 × 8-mm gelatin sponge (with or without iodized oil or cyanoacrylate) was inserted from the fundus into the aneurysm, at the time of surgical construction, in an effort to completely occlude it. Cyanoacrylate-coated and uncoated sponges were placed in a random manner. Uncoated sponges were prepared from gelatin sponge blocks that were cut and hydrated in an autoclave for 10 minutes in phosphate-buffered saline. Cyanoacrylate-coated sponges were prepared by dipping dry sponges in a 1.5-mL mixture of 0.5 mL of n-butyl-2-cyanoacrylate (NBCA) (Histoacryl; B. Braun, Melsungen) and 1 mL of iodized oil. The sponges were then soaked in phosphate-buffered saline to hasten polymerization and were used for embolization after thorough washing. The effects of cyanoacrylate-coated sponges on the results of embolization were then tested at 3 weeks (n = 2) and at 3 months (n = 6) in a surgical bifurcation model that may have a higher propensity for recurrences. Bifurcation aneurysms were packed with a 12 × 8-mm acrylic-coated sponge at the time of surgical construction, before fundus closure, as described above, and were compared with results in lateral wall constructions. Next, we explored strategies to improve the safety of endovascular cyanoacrylate delivery. Because stents are not designed for bifurcation aneurysms, lateral wall aneurysms (n = 6) were used to compare stray embolization during cyanoacrylate-alone delivery (n = 3) with injections under the protection of stents (n = 3) in the parent artery. Bifurcation aneurysms (n = 16) were used to compare cyanoacrylate-alone embolization (n = 1) with injection under the protection of a single intraaneurysmal coil (n = 12) or ANBD (n = 3). For cyanoacrylate deposition under the protection of a coil, a single 0.015-inch caliber coil (8 mm × 20 cm) was first positioned inside the aneurysm with one to three loops crossing the neck. The microcatheter was advanced until its tip reached the wall of the fundus. The cyanoacrylate mixture of 50% NBCA and 50% iodized oil was then injected very slowly, and the catheter was retrieved as the aneurysmal sac progressively filled. Once at the neck, the injection was stopped, often prematurely, to avoid spilling into the parent artery. The catheter was suddenly pulled out after a 30-s curing period. Intraaneurysmal cyanoacrylate deposition was also achieved with a microcatheter introduced through the mesh of 3.5-mm stents (ACS Multilink Rx Duet; Guidant, Santa Clara, CA) positioned initially inside the carotid artery, in front of the necks of lateral wall aneurysms, or through the struts of a prototypic ANBD positioned at the necks of three bifurcation aneurysms. Finally, we compared angiographic results and mean neointima thickness after embolization of bifurcation aneurysms with coils alone (n = 6) and with cyanoacrylate delivered behind a coil (n = 6), in animals already described and followed up for 3 months. We compared results of endovascular coil embolization of lateral wall and bifurcation aneurysms (Table 1)). The evolution of the angiographic scores at 3 months (T3) was worse in bifurcation aneurysms treated with coils (T3 − T0 = 2.60 ± 0.55) than in lateral wall aneurysms treated with coils (T3 − T0 = 0.50 ± 1.05) (P = .003). Macroscopically, coils were apparently bare or covered by a translucid membrane in most bifurcation aneurysms at 3 months. Recurrences were seen as open spaces between coils or between coils and the lateral wall of the venous pouch. Histologic examination revealed that aneurysms treated with coils alone displayed a richly vascularized tissue between coils, with multinucleated giant cells. At the neck, the neointima, when present, was often very thin. Recurrences were detected as opened endothelialized wedge-shaped spaces between the aneurysmal wall and the mass of coils (Fig 1). The neointima measured at the surface of the coils was also significantly thinner in bifurcation aneurysms (29.80 μm ± 24.35) than in lateral wall aneurysms (170.00 μm ± 42.43) (P = .0004). The endovascular bifurcation model thus permits the study of recurrences at 3 months in an experimental setting that more closely mimics the clinical problem we wanted to address. Axial photomicrographs show histologic findings 3 months after embolization. h indicates cyanoacrylate; c, coils; ca, carotid artery; n, neck; ra, recurrent aneurysm; vp, venous pouch; t, vascularized fibrous tissue. (HPS, original magnification ×20). A, Lateral wall aneurysm, obtained after embolization with cyanoacrylate-coated sponge. Aneurysm remains obliterated by a thick and fibrous neointima. B, Lateral wall aneurysm, obtained after embolization with sponge alone. Aneurysm shows large recurrence and hypertrophy of the venous pouch. C, Bifurcation aneurysm, obtained after embolization with coils alone, shows recurrence around the mass of coils. Neointima is thin and incomplete at the neck. Coils are embedded in vascularized fibrous tissue. D, Bifurcation aneurysm, obtained after embolization with coils and cyanoacrylate, shows no recurrence. Note aneurysm filled with cyanoacrylate. There was no significant difference between the initial angiographic scores (T0) of lateral wall aneurysms treated with uncoated sponges and those treated with sponges coated with iodized oil or cyanoacrylate (Table 2). The evolution of the angiographic scores at 3 weeks (T3 − T0) was positive for aneurysms treated with uncoated sponges (1.00 ± 0.87), null for aneurysms treated with iodized oil (0.0 ± 1.0), and negative for aneurysms treated with cyanoacrylate-coated sponges (−0.52 ± 1.29). There was a significant difference among the groups (P = .0002), and comparisons were significant at the .05 level between the cyanoacrylate-coated and the uncoated sponge groups. In other words, aneurysms treated with uncoated sponges showed worse angiographic scores (or recurred) at 3 weeks, whereas aneurysms treated with cyanoacrylate-coated sponges improved by 3 weeks compared with initial results. When treatment with cyanoacrylate-coated sponges was compared with treatment with uncoated sponges at 3 months, the evolution of the angiographic scores differed significantly (P = .003) (Table 2). Aneurysms treated with uncoated sponges showed a high rate of recurrence (T3 − T0 = 1.86 ± 0.69), whereas aneurysms treated with cyanoacrylate-coated sponges showed improvement compared with initial results (T3 − T0 = −0.67 ± 1.51) (P < .05). Macroscopic examination of specimens revealed that aneurysms treated with uncoated gelatin sponges consistently showed a residual or recurrent neck limited by a thin dark membrane. Aneurysms treated with cyanoacrylate-coated sponges showed a thicker whitish membrane, even when there was a residual neck. 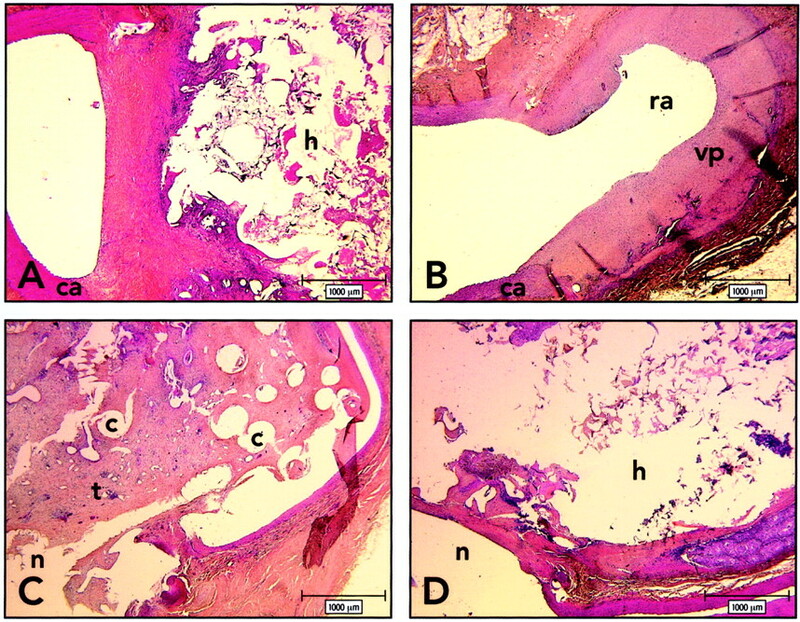 Histologic findings after sponge embolization of lateral wall aneurysms in dogs have been described (8, 9). In brief, at 3 weeks, granulation tissue around uncoated sponges was more abundant at the fundus than at the neck of the aneurysm. This tissue is made of mononuclear inflammatory cells, macrophages, α-actin-positive mesenchymal cells, and numerous capillaries. At the neck, the space between the sponge and the wall of the venous pouch remains patent. The surface of the sponge is covered by a thin neointima, composed of a layer of endothelial cells and few layers of α-actin-positive cells in a collagenous matrix (Fig 2A, D). Histologic findings 3 weeks after embolization. ca indicates carotid artery; g, sponge; r, recurrence; S, suture; L, iodized oil. (HPS; magnification ×20 [A–C], ×100 [D–F]). A and D, Axial section of lateral wall aneurysm and carotid arteries, obtained 3 weeks after embolization with gelatin sponge. Note recurrence and thin neointima covering the uncoated sponge. B and E, Axial section of lateral wall aneurysm and carotid arteries, obtained 3 weeks after embolization with iodized oil. Note recurrences and thin neointima covering the iodized oil-coated sponges. Higher magnification reveals that the neointima is composed of a few layers of spindle cells embedded in a collagenous matrix and covered by an endothelium in aneurysms treated with iodized oil-coated sponges. C and F, Axial section of lateral wall aneurysms and carotid arteries, obtained 3 weeks after embolization with cyanoacrylate-coated sponges. Aneurysms treated with cyanoacrylate-coated sponges show a thicker neointima and complete obliteration of the neck. Aneurysms treated with iodized oil–coated sponges displayed apparent lipid globules within the sponge and a few within the wall of the aneurysm at 3 weeks. Lipid globules were always surrounded by a granulomatous inflammatory reaction. The thickness of the neointima at the neck was similar for sponges with and those without iodized oil (Fig 2B, E). At 3 weeks, cyanoacrylate-coated sponges elicited a stronger inflammatory reaction than did uncoated sponges. The cyanoacrylate itself was lost by the processing of the specimens, but its position was revealed by open spaces surrounded by a granulomatous reaction. The most striking difference between aneurysms treated with cyanoacrylate-coated sponges and those treated with uncoated sponges was the thicker neointima in the former, with a higher collagen content (Fig 2C, F.
There was a significant difference in neointimal thickness at 3 weeks among the groups (P = .003). The neointima of the aneurysm measured at the surface of the cyanoacrylate-coated sponges was thicker (575.53 μm ± 328.27) than that of the uncoated (99.15 μm ± 112.35) or iodized oil-coated (185.75 μm ± 198.14) (P < .05) sponges (Table 2). The inflammatory reaction was decreased at 3 months as compared with 3 weeks. The neointima became strongly fibrotic at 3 months (Fig 1A). The neointima measured at the necks of aneurysms treated with cyanoacrylate-coated sponges was significantly thicker at 3 months (429.50 μm ± 183.03) than the neointima found in aneurysms treated with uncoated sponges (124.43 ± 120.02 μm) (P = .03). Thus, lateral wall aneurysms treated with cyanoacrylate-coated sponges showed thicker neointimas at the necks and improved angiographic evolutions as compared with aneurysms treated with uncoated sponges. There was no significant difference in initial angiographic scores (P= .3) or evolution at 3 weeks (P= .2) of lateral wall aneurysms compared with bifurcation aneurysms treated with cyanoacrylate-coated sponges. At 3 months, the evolution of the angiographic scores tended to be worse for bifurcation aneurysms (T3 − T0 = 0.83 ± 0.41) than for lateral wall aneurysms (T3 − T0 = 0.67 ± 1.50) (P= .06). The thickness of the neointima at the necks of bifurcation aneurysms treated with cyanoacrylate-coated sponges (268.7 μm ± 246.5) was not significantly different from that in lateral wall aneurysms treated similarly (429.5 μm ± 183.0) (P= .23). The endovascular delivery of cyanoacrylate in the absence of other devices led to leaking of material into the parent artery in all cases (four of four cases) (Fig 3). When cyanoacrylate was injected after placement of a single coil, its delivery was better controlled (Fig 4), but parent artery embolization still occurred with 25% of injections (three of 12 injections). Endovascular cyanoacrylate delivery through a stent was confined to the aneurysm in all cases (three of three cases). 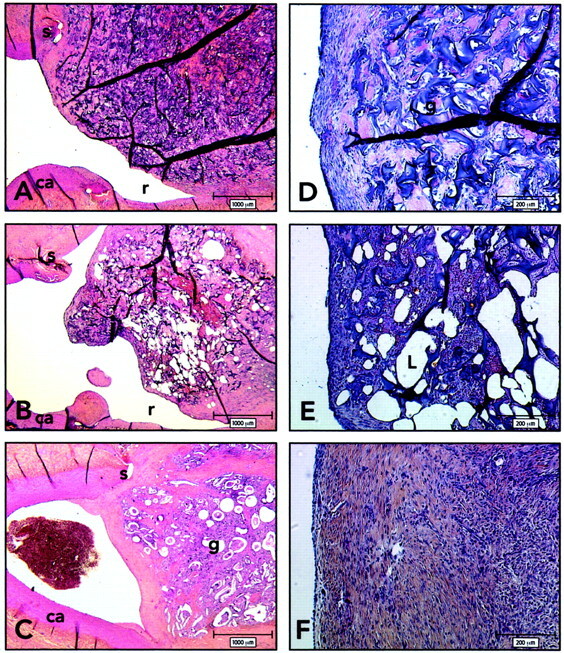 Cyanoacrylate delivery through the ANBD in bifurcation aneurysms led to stenosis of the left carotid artery in one animal (one of three animals). The microcatheter was cemented in situ in all cases treated with endovascular cyanoacrylate, but it could always be withdrawn along with a small fragment of polymerized glue at the tip. A and B, Spot radiographs obtained during endovascular cyanoacrylate delivery. The cyanoacrylate deposition is limited to the aneurysm at the beginning. C, Spot radiograph obtained after endovascular cyanoacrylate delivery. The cyanoacrylate spills through the neck at the end of the injection. D, Carotid arteriogram shows that spilling of cyanoacrylate caused severe stenosis of the bifurcation. Endovascular cyanoacrylate embolization using coil protection. A and B, Radiographs obtained before (A) and after (B) carotid injection of contrast agent show how cyanoacrylate deposition can be limited by a single coil. Cyanoacrylate is seen as radiopaque material within and surrounding loops of coils. Note complete obliteration of the aneurysm without compromising the bifurcation. Initial angiographic scores were better after coil embolization alone (0.40 ± 0.89) than after cyanoacrylate deposition behind a coil (1.00 ± 1.16) (P = .02) (Table 3). There was no significant difference in the evolution of the angiographic scores at 3 weeks (P = .1). At 3 months, the evolution of the angiographic scores was negative for aneurysms treated with cyanoacrylate behind a coil (−0.50 ± 1.92) but positive after coil embolization (2.60 ± 0.55). This difference was significant (P = .01). Bifurcation aneurysms treated with cyanoacrylate alone or deposited under the protection of a metallic device showed a thick membranous covering at the neck. Aneurysms treated with cyanoacrylate were filled with the polymer. No fibrous tissue was seen within the acrylate core (Fig 1D). Instead, an inflammatory and fibrous reaction persisted at the periphery of the aneurysmal wall. The neointima was thicker as compared with coil embolization only and showed a more complete closure of the neck with less frequent recurrences. The neointima found at the necks of aneurysms treated with cyanoacrylate deposited behind a coil (300.00 μm ± 50.09) was significantly thicker than that in aneurysms treated with coils alone (29.80 μm ± 24.36) (P = .0008) (Table 3). Thus, endovascular treatment of bifurcation aneurysms with cyanoacrylate led to improved angiographic evolutions and thicker neointimas at 3 months compared with coil embolization alone. Recurrences after endovascular treatment of human aneurysms have been reported in 10–20% of cases; many more lesions remain incompletely treated and may recur during longer follow-up periods (3, 5). Recurrences are more frequent in aneurysms with wide necks and are the rule in selective endosaccular treatment of giant, partially thrombosed aneurysms (25). Although pathologic studies of human aneurysms treated with Guglielmi detachable coils are few, satisfactory healing has been associated with thrombus formation, migration of mesenchymal cells, and deposition of connective tissue replacing the thrombus and forming a thick neointima at the necks of treated lesions (26). Conversely, recurrences have been associated with deficient thrombosis and lack of a neointima at the surface of the coils (9, 22, 25, 27). Recurrences are also associated with coil “compaction,” a phenomenon that can occur months to years after embolization. Coil compaction may be a secondary phenomenon, possibly caused by persistent abnormal flow and mechanical strain on coils in aneurysms with deficient healing at the neck. Our hypothesis is that if the aneurysmal sac and neck can be completely occluded, normal healing phenomena will respond with the formation of a thick neointima and permanent obliteration of lesions. This hypothesis is supported by experiments performed in porcine lateral wall venous pouch aneurysms that virtually always show complete and permanent obliteration, even with gelatin sponges (8, 14, 28). This phenomenon may necessitate a strong tendency of thrombus and neointima formation, as seen in pigs (29–31), and cannot realistically occur with reliability when using current technologies in humans and other species that do not thrombose so readily (22). The increased incidence of recurrences in wide-neck aneurysms may simply reflect that these lesions are rarely completely excluded from the parent artery (25). Platinum coils are weakly thrombogenic, and “packing density” at the necks of treated aneurysms is often inferior to that obtained at the fundus. Incomplete thrombosis may be hidden by radiopaque coils so that apparently “completely” embolized aneurysms may seem to recur months after treatment, whereas deficient healing or microscopic recurrences may have been present from the start (22). When complete exclusion of the aneurysm cannot be accomplished without stenosis of the parent artery, as is currently the case with Guglielmi detachable coils in many wide-neck lesions, another goal may be to increase the thickness of the neointima that forms at the surface of the embolic agent, to stabilize the evolution of residual necks. Embolization with thrombogenic polymers may obliterate aneurysms (including necks) more completely and thus improve the results of endovascular treatment. If a residual neck is still present after embolization, polymers could improve the stability of the morphologic results by stimulating the formation of a thicker neointima. Our results confirm the strong tendency for recurrences in canine aneurysms treated with sponge embolization (8, 9). These recurrences can be seen routinely, even in lateral wall aneurysms, as early as 3 weeks after treatment (9). Poor healing is associated with deficient thrombosis and thin neointima formation in this model (9). The addition of cyanoacrylate completely changed the biology of our model. The thrombogenicity of cyanoacrylate, a strong inflammatory reaction, or other phenomena resulted in thick neointima formation and improved morphologic outcome at 3 weeks. We attempted to isolate the possible effects of the two components of the glue mixture. The addition of iodized oil alone caused a significant inflammatory reaction, but there was no statistically significant difference in neointima thickness or in the morphologic results with gelatin sponges in the five animals studied. We could not investigate the addition of cyanoacrylate alone without iodized oil, because the sponges became hard, friable, and difficult to insert into the venous pouches. The polymer itself is thought to be the active ingredient in the glue mixture, but we cannot, at this time, exclude some effects from iodized oil. Comparison of the results obtained with sponges covered with cyanoacrylate versus uncoated sponges in the same animals kept for 3 months confirmed the benefits of cyanoacrylate embolization. The aneurysms embolized with uncoated sponges showed frequent recurrences, whereas those treated with cyanoacrylate-covered sponges showed significantly improved morphologic results (Fig 1). Again, the neointima was thicker at 3 months in aneurysms treated with cyanoacrylate compared with control sponges. However, recurrences still occurred in 50% of incompletely treated lesions. The lateral wall venous pouch carotid aneurysm model has been helpful for evaluating, within the same animal, the effects of growth factors and platelet extracts compared with control sponges (13, 14). The hemodynamic stress at the neck is, however, less important than in bifurcation models, which more closely mimic human aneurysms (22). We thus wanted to test cyanoacrylate-covered sponges in a bifurcation model. Bifurcation aneurysms treated with cyanoacrylate-coated sponges showed a tendency for recurrences at 3 months compared with lateral wall aneurysms, despite similar angiographic scores at 3 weeks. Because of these findings, and although neointimal thickness 3 weeks after cyanoacrylate embolization was approaching values found in porcine aneurysms, which are animals that routinely heal after embolization, we propose that causes other than the lack of initial thrombosis and early neointima formation are involved in aneurysmal recurrences in this animal model. Although the surgical implantation of gelatin sponges has been helpful in better understanding healing mechanisms in pigs (8) and is a reliable model of recurrence in dogs (9), it differs from the endovascular deposition of coils in clinical practice. Gelatin sponges elicit a stronger inflammatory reaction than do platinum coils; embolization is performed at the time of surgical construction so that the reaction to the surgical trauma occurs synchronously with the reaction to the embolic agent. Dense endovascular packing of lateral wall aneurysms was thus performed in six aneurysms 2 weeks after surgical construction, with techniques routinely used in clinical practice. These aneurysms were almost always completely obliterated, including the necks, and recurrences were less frequent and of a lower magnitude than those found in the surgical sponge model. The thickness of the neointimal layer was more difficult to measure reliably with coils, but pathologic findings at 3 months confirmed that neointima formation could proceed with efficacy in this situation. Thus, lateral wall canine aneurysms densely packed with coils do not show significant recurrences at 3 months, and this model as such does not reproduce (at least within 3 months) the problem we want to address. When bifurcation aneurysms were treated with coils, the evolution of the angiographic scores at 3 months was significantly worse than was the evolution in lateral wall aneurysms despite satisfactory initial results. Neointima formation was also significantly thinner than in lateral wall aneurysms. This bifurcation model was, therefore, chosen to test the potential benefits of cyanoacrylate in decreasing recurrences after endovascular treatment of aneurysms. Initial morphologic results after cyanoacrylate embolization were inferior to those obtained with coil embolization, mainly because the injection of glue was interrupted early for fear of cerebral embolization. However, endovascular cyanoacrylate deposition in bifurcation aneurysms significantly improved the angiographic evolution at 3 months compared with coil embolization, despite inferior initial angiographic results. Neointima formation was documented in all specimens, and its thickness was significantly increased in comparison with that of bifurcation aneurysms treated with coils. We think that these results were achieved because of the higher thrombogenicity of cyanoacrylate versus coils and because this strategy could create a more impervious barrier at the necks of treated aneurysms. The space inside the aneurysm was more completely replaced by the embolic agent in cyanoacrylate-treated aneurysms, as compared with coils (Fig 1D). The large volume of clot filling the spaces between coils and at the interface between the coils and the walls of the aneurysm may favor recanalization, another hypothesis that has to be considered. These animal models have many limitations: the response to the surgical trauma, the evolution of the venous pouch, and the simultaneous biologic reaction to glue, coils, and stents add uncertainties to the interpretation of the results. Nevertheless, we conclude from our studies that cyanoacrylate has the potential to improve results of embolization of aneurysms. The intraaneurysmal injection of cyanoacrylate is difficult to control (Fig 3). Some form of flow control or devices to mechanically restrain the deposition of cyanoacrylate are necessary to prevent cerebral emboli. Previous authors have used balloon protection with polymer or coil embolization of aneurysms (21, 32, 33). Temporary balloon occlusion of the parent artery may be effective in lateral wall aneurysms (33) but cannot be applied to the majority of lesions that arise most often at bifurcations. Metallic stents, positioned across the neck inside the parent artery, if they can be designed for intracranial vessels, could also be effective, as shown in the three cases we studied and as reported previously (34, 35), but are at least restricted by the same limitations. We have attempted to use coils to control cyanoacrylate deposition (36). Coil protection at the neck may apply to most intracranial aneurysms. This strategy has worked surprisingly well despite only one to three loops of coils bridging the neck of the aneurysm. We think that coils may act via multiple mechanisms: 1) they may modify flow patterns inside the sac as well as at the neck; 2) they may serve as a skeleton for polymerization of the cyanoacrylate; and 3) they may form a physical barrier to the cyanoacrylate mass. Very slow injection with the microcatheter near the dome of the aneurysm is also probably helpful, because flow velocities are much dampened in that region (37), and cyanoacrylate may adhere to the aneurysmal wall as it polymerizes. Despite improved control of cyanoacrylate deposition with a single coil, undesirable escape of material occurred in 25% of the injections, a clearly dangerous frequency to consider for clinical application of this technique. We did not attempt to place more coils inside the aneurysms before cyanoacrylate injection. This strategy may provide added protection, but we fear that the radiopacity of multiple coils may decrease fluoroscopic control by the operator. The ANBD, a new device designed to treat wide neck bifurcation aneurysms (38), may have value in controlling cyanoacrylate deposition, but the number of aneurysms studied is too small for accurate assessment. In addition to considerations regarding security, the difficulty in controlling the deposition of cyanoacrylate is also responsible for inferior initial angiographic results, compared with endovascular treatment with coils, which could lead to less favorable long-term results (39). Gluing the microcatheter inside aneurysms is yet another problem that could be troublesome in clinical practice. We have shown that the addition of cyanoacrylate to sponges used for embolization produces a thicker neointimal layer at the necks of treated lesions and leads to improved angiographic results in the lateral wall aneurysm model. When tested in the bifurcation model, endovascular cyanoacrylate embolization behind a coil was associated with fewer recurrences at 3 months compared with that of platinum coils. The injection of cyanoacrylate alone is dangerous. Escape of the polymer during deposition can be better controlled with a single coil placed at the neck of a treated aneurysm, but parent vessel embolization still occurred in 25% of the animals. Future goals include the identification of mechanisms responsible for this positive outcome, the conception of new embolic agents that could trigger similar results, and the development of new devices to safely deliver cyanoacrylates inside human aneurysms. We thank Ovid Da Silva for editing the manuscript, Marie-Claude Guertin for expert statistical assistance, and Rose-Mai Roy for excellent secretarial work. Supported in part by the Medical Research Council of Canada, Fonds de la Recherche en Santé du Québec, and by the Technological Platform of the Centre Hospitalier de l’Université de Montréal. Accepted after revision August 7, 2001.